Wrap your rope around a dolphin. A dolphin cleat, that is. This is an idea that I can't believe had not been thought of already (maybe it has?) because it makes so much sense. 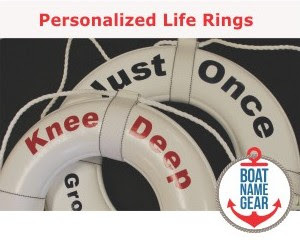 Add form to the functionality of one of the most basic items on any boat or dock with cleats designed as dolphins or bass! The geniuses behind these cleats are from a company called - of course - Creative Cleats based in Holland, New York. I only wish I thought of it first. While it was nice to see a happy ending to this story in the Houston Chronicle, there didn't have to be a story at all... The incident could have been avoiced altogether and not be so close to tragic. Boaters adrift all night long in rough seas and the only communication device onboard is a cell phone!? That's just crazy. I just did a quick search at FirstBoat's electronics store and found several VHF radios for under $100, and some as cheap as $50. What about GPS? Those things are now a necessity with prices as low as $100 to $200 for a battery operated Garmin, or even less for the Lowrance iFinder. The boaters in this article had use of their cell phones for some time... Imagine if they were able to give somebody their coordinates from a GPS device? They may not have had to spend all night on a drifting boat in rough seas. Luckily, it turned out alright for them, but isn't it worth a few hundred dollars - when you just spent thousands on a boat - to have some basic battery powered marine electronic equipment on board? That's what it looks like to me, anyway. Check out this new WiFi device being produced in the UK. It simply plugs into your USB port on your laptop, and lets you access Wi-Fi hotspots from nearby marinas or other businesses on-shore offering the service that your laptop's traditional wi-fi receiver wouldn't normally pick up. Thanks to WiFiFreeNet for the tip, and to BYM for announcing the product. 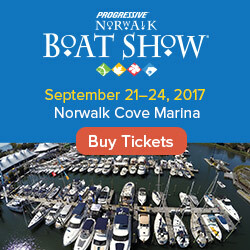 For more on the subject of Wi-Fi at marinas, visit WiFiMarine.org. Thought I'd share this video I just stumbled across taken by somebody sailing on the Pacific. The video was just uploaded to YouTube a few hours ago, so perhaps the footage is from as recently as this week!